COCOA BEACH, FL--Bolted to the back of a 747 jumbo jet, the space shuttle Endeavour took off on its final voyage Wednesday, a "bittersweet" valedictory tour highlighted by low-altitude passes over NASA field centers, towns and cities along the way to museum duty in Los Angeles, giving the public one last chance to see the winged spaceplane in flight. Running two days late because of stormy weather along the Gulf Coast, the NASA 747 and its 78-ton payload lifted off the Kennedy Space Center's 3-mile-long shuttle runway at 7:22 a.m. EDT (GMT-4), following a southeasterly flight path for a low-level pass along beaches stretching from Cape Canaveral south to Patrick Air Force Base just beyond Cocoa Beach. At that point, the huge airplane slowly turned and flew back up the Indian River to the Kennedy Space Center, flying over the Visitor Complex, the Cape Canaveral Air Force Station and the Launch Complex 39 area before climbing to the west and disappearing from view, leaving the spaceport for the last time. Despite low clouds that hampered visibility, area residents and tourists turned out in force to witness the shuttle's departure and NASA's final ferry flight, a long-familiar sight along Florida's "space coast." 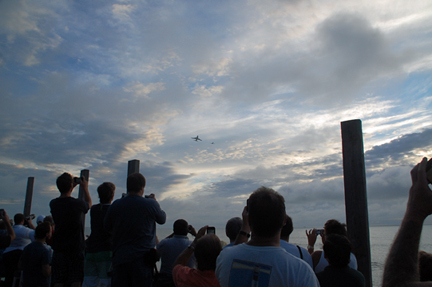 Pat Hill of nearby Port St. John, Fla., watched the fly over from the Cocoa Beach Pier. "It's sad," she said a few moments before Endeavour flew almost directly overhead. "I've seen a lot of them, and it's always exciting. I wanted to get a picture of the last one. It's very sad." Delia Brillon of Merritt Island, Fla., said she was "sad for all the people who lost all the jobs." "They're looking forward to something better," she said. "I always believe, even though I'm a very old lady, I believe in progress. The show must go on. But I feel sorry for those people who lost all those jobs." Sune Echeles of Merritt Island summed up the feelings of many when she said Endeavour "had a great run, it had a huge impact on history and I'm sorry to see it leave the area." "But I'm hoping that we will still be growing and that the space center will come up with something new for the space program and that it will continue," she said. "We need to continue exploring space and I'm sure they have something in the works. They've got to. This area is very much a space center support area, so we are hit by the fact that it's closing down. It's bittersweet to watch it retire, but we're out here ... to say goodbye." 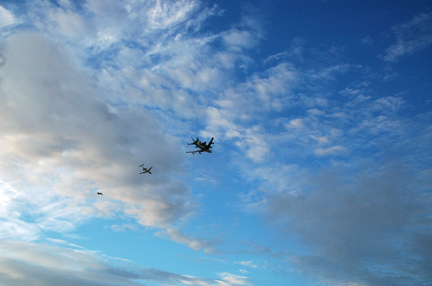 After crossing the Gulf of Mexico, the flight plan called for a 1,500-foot-high pass over NASA's Stennis Space Center near Bay St. Louis, Miss., and then over Lockheed Martin's Michoud Assembly Facility on the east side of New Orleans, where the shuttle's external fuel tanks were manufactured. The first leg of the cross-country flight to Los Angeles ended with a low-altitude flight over Houston and the Johnson Space Center, where mission controllers orchestrated Endeavour's 25 missions. With thousands of area residents and NASA personnel looking on, the shuttle carrier aircraft then landed at Ellington Field, just outside the space center, at 11:40 a.m. (10:40 a.m. CDT). The aircraft will remain parked near NASA Hangar 990 for the rest of the day, on display for area residents and nostalgic NASA personnel. If all goes well, Endeavour will take to the sky once more at sunrise Thursday, flying first to El Paso, Texas, for refueling and then on for low-level flights over the White Sands Test Facility near Las Cruces, N.M., and finally, NASA's Dryden Flight Research Center at Edwards Air Force Base, Calif. Fifty four of NASA's 135 shuttle missions ended at the Mojave Desert Air Force base just north of Los Angeles. Early Friday, weather permitting, Endeavour will head north for a San Francisco fly over and low-altitude passes over NASA's Ames Research Center, Sacramento and other communities before returning to Los Angeles and flying over the Griffith Observatory, Hollywood Hills and the historic Los Angeles City Hall. 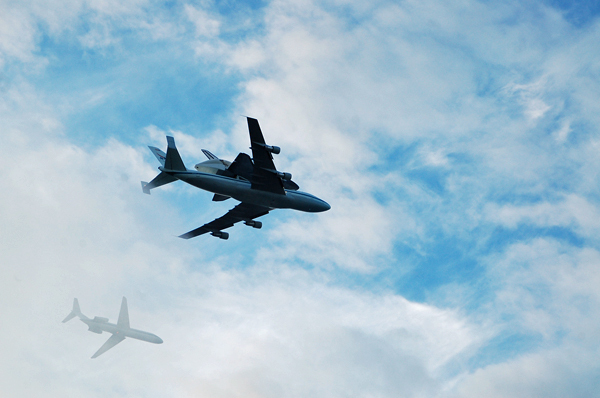 Touchdown at Los Angeles International Airport is expected around 2 p.m. (11 a.m. PDT). The orbiter will be housed temporarily in a United Air Lines hangar and then hauled along 12 miles of Inglewood and Los Angeles streets Oct. 12 to its final destination at the California Science Center. Earlier this year, NASA delivered the veteran shuttle Discovery to the Smithsonian Air & Space Museum's Steven F. Udvar-Hazy Center at Dulles International Airport outside Washington. The same team then flew the prototype shuttle Enterprise to New York City for a barge ride to the Intrepid Sea, Air & Space Museum. 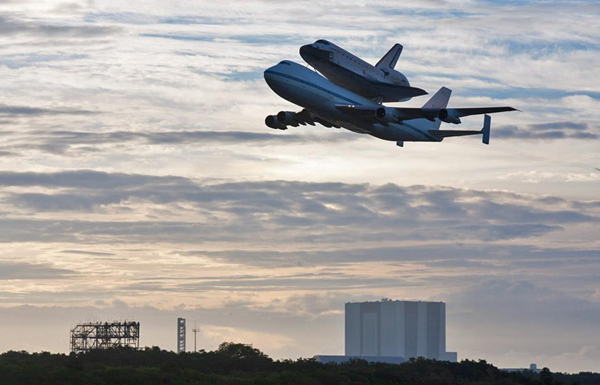 Atlantis will remain at the Kennedy Space Center in Florida. In November, the spaceplane will be hauled 10 miles to a new $100 million display facility under construction at the spaceport's privately operated Visitor Complex. The new facility is scheduled to open next summer.